It’s impossible for us to even list a fraction of what the Magnificent Mile, the heart of downtown Chicago, can offer. One of the busiest stretches in the city, the Mag Mile is home to a giant range of shopping, dining, and entertainment options that people travel from all over the country to experience. As your Magnificent Mile movers, we’ll help you navigate the busyness and settle right in to your new home. Then you can start enjoying your new neighborhood right away, while having easy access to slightly quieter areas nearby. 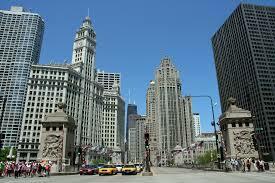 A few thousand people live in and around the Magnificent Mile, which is centered on a stretch of Michigan Avenue. There are more women than men, and more singles than families. The average age skews around 40, while average yearly income is 90k and above. Many of your Mag Mile neighbors will also have Master’s degrees. The Magnificent Mile has had its name for almost a century, and was planned and built by the city of the Chicago in the early 20th century. Since then, it’s been a thriving commercial center. Today you’ll notice several historic buildings with a signature art deco style, which come from the time the neighborhood was built. Now you’ve got the gist, here are some highlights—and basics—we found to help you start your Mag Mile life. Water Tower Place: Mall with eight stories of food and shopping, plus a live theater. 900 North Michigan Shops: Another mall, high end stores and dining. Shops at North Bridge: A third mall, pet and kid friendly. Eataly: Three floors of restaurants, food, and kitchen supplies. Museum of Contemporary Art: Near Water Tower, for a shopping break. Chicago 360: AKA the top of the Hancock Building. AMC 600: Movie theater, full seatside food service. Lookingglass Theatre Company: Original live productions. Rush Hour Concerts at St James: Music to end a commute on. Pizza: Giordano’s. Classic Chicago. Delivers. Burgers: m burger. There’s one in Water Tower, too. Delivers. Southwest USA: Bandera. Make lunch reservations. Rooftop: NoMi Kitchen. Sushi and more. Old School: Rosebud on Rush. Local feel, classic Italian. Fine Dining: Cafe Spiaggia. Has a lake view. Casual Eating: Do-Rite Donuts and Chicken. Counter service, unique flavors. Gluten Free: 676. Great options all around. Cocktails: Coq d’Or. The Drake Hotel’s bar features decades’ worth of mixes. Wine: Eno. Pairings with cheese and chocolate. Wine with Food: DiSotto Enoteca. A few cocktails, too. High Up: 52Eighty. Rooftop lounge. Low Key: Timothy O’Toole’s. Big beers, burgers, and TVs. Comfort: Beacon Tavern. Elegant setting and tasty food. Whole Foods: Two locations nearby. Argo Tea Cafe: Technically tea, but same concept. A couple locations. Sunny Side Up and Coffee Shoppe: Full meals upstairs, pastries downstairs. Equinox Gold Coast: Equipment, classes, pool and spa. In Shops building. Women’s Athletic Club: The first women’s gym in the US. Equipment, pool and spa. Lakeshore East Dog Park: Great facilities for humans, too. This has been a tiny sampling of the great things you’ll experience at your new Magnificent Mile home. As a seasoned Magnificent Mile moving company, we’ve learned all about the staples and cool places in the area. We’re happy to share more! As you’re planning your big move, cross one major thing off your to-do list, and book Magnificent Mile movers who’ll a take load of stress off your mind. Call us at New City Moving, and we’ll help you move safely, smoothly, and on-schedule, so you can settle right in and start living your greatest Mag Mile life.